After nine previous attempts, Aylesbury United finally secured the first ever league win at the ASM Stadium on a windy and wet afternoon with a deserved 1-0 victory against Potters Bar Town on Saturday. It’s been a long, arduous season so far for the Ducks but this was a welcome relief as Lewis Osborne’s goal two minutes before half-time saw Glyn Creaser’s side put some breathing space between themselves and the bottom two in Division One Central of the Southern League. For the second week running, United were forced to name a squad with just three on the bench, one of those being returnee Warren Garcia, to face a Potters Bar side sitting eight places and 11 points ahead of them in the table. The Scholars came into the game on a run of three wins and two defeats from their last five games, and with those two defeats coming against St Ives Town and Northwood, they would have been confident of picking up points against an Aylesbury team that had drawn one and lost four of their previous five games. 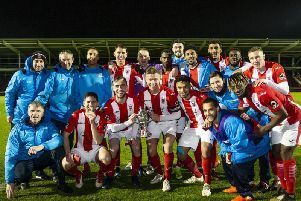 The return of Eoin Casey and Billy Adcock to the ASM Stadium in the Potters Bar starting XI would also have added to their determination to secure all three points. Potters Bar certainly started the brighter and dominated the first ten minutes but without creating any real clear cut chances as the Ducks slowly worked their way into the game and created the first real opening when a snap shot from Shaun Owens needed a flying save from visiting Town goalkeeper Ben Goode. The wind was again playing a big part in proceedings and nearly led to a goal for United when a Jake Bewley corner crashed against the bar before going out for a goal-kick. The game was a fairly even affair thereafter with neither keeper being seriously tested. But that all changed as the first half drew to a close when a fine sweeping move from defence saw Jack Wood released on the right and his first-time cross was deftly nodded over the stranded keeper by Lewis Osborne for his first league goal to put United 1-0 ahead. And with just two minutes of the first half remaining, there was no time for Potters Bar to respond and the teams left the field with the Ducks holding a valuable 1-0 lead. With no changes at half-time, United took to the field for the second half with the strong wind in their faces knowing they would face a barrage from the Scholars which duly arrived. But with the Ducks central midfield pairing of Greg Williams and Shaun Owens working tirelessly to break up any attacks and the defence standing strong, Zaki Oualah in goal was rarely troubled. As with the first half, United grew into the game and Sonny French, playing in a number 10 role behind Stacey Field, began to have more influence on the game, culminating in a mazy run from his own half to the edge of the Potters Bar box before his shot dribbled past the post. Two quick substitutions saw Ollie Hogg replace Lewis Osborne and Warren Garcia come on for Luca Seminerio and it was Garcia who nearly made an explosive start with his first touch of the ball when his powerful shot from the edge of the area was only kept out by a superb save by Goode. As could be expected, the final ten minutes were a nervy affair with the players, management and crowd all sensing the nearness of their first win at home. But there was to be ne disappointment this time as the referee brought the game to a close and all could celebrate a fine and much-needed win. The subsequent news of Fleet’s 6-1 defeat at Ware also meant that the Ducks moved up one place to 19th in the table to round off a pleasing day. Next up for United is a Red Insure Cup tie against Wantage on Wednesday, also at the ASM Stadium.